A flashlight is one of those products that everyone should own. Whether it is going out camping, searching the attic or in case of emergencies, it’s an item that you’re going to need to use sooner or later. They are all made differently though and finding the best flashlight is important. In order to find the best torch though there is a lot that you need to consider. The type of torch is going to be crucial as well as its design and size. After that there are other important features such as water resistance, battery life and reliability among others. In this guide we will explain all of those key features and why they are important to you. We have also completed flashlight reviews on the 10 best products to show you what is available. Once you’ve finished reading, you’ll know exactly what flashlight you need. 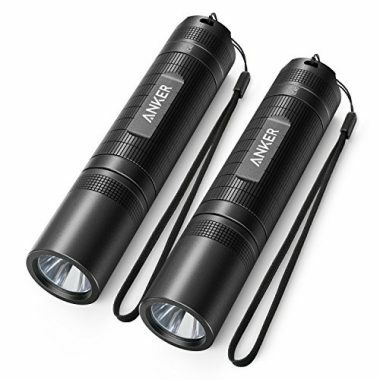 Anker are well-known for producing quality lights and that is no different with this top rated torch. The LED flashlight is able to shine up to 900 lumens which is incredibly bright and can shine the distance of two football fields, which gives it a huge range and the brightest flashlight you can find for that size. It can either be used as a fully zoomed in light or one with a wider angle. The flashlight has five different adaptable settings on it as it can either be used on high, medium or low and it also has SOS and strobe settings too for when you are in an emergency. This is a very good flashlight and it tough and reliable due to its water resistance and shock resistance too. It has a very good design and despite all that power and durability, it is still fairly compact in size. 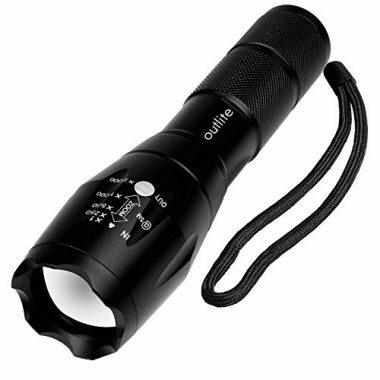 This is one of the top flashlights on the market and is very highly rated by those who have used it. This is another flashlight which comes highly rated and is going to be a long lasting flashlight, which takes either a lithium-ion battery or 3 AAA batteries. As with the previous model, this light has five different modes of high, medium and low and those emergency settings of strobe and SOS. The light also features an adjustable focus and can work as easily being used for a large area illumination as it can being a spotlight, which makes this torch highly versatile and able to give you the light that you need in multiple different circumstances. It has a very bright light which is going to be able to give you everything that you need and it is a very well designed product too. It has a textured handle which is going to be able to give you a high level of grip and the flashlight is water resistant. If you’re looking to give a touch to each family member on a camping trip or simply want to have one in each room, then this would be a perfect product for you. These compact lights come in a pack of four and they are small but still able to shine very brightly. That’s partly down to the fact that they have 9 small LED lights per torch which are able to produce a very high level of light. They have an aluminum case which is going to be very durable and these lights will be able to take a lot of punishment. They have a long running time and are very easy to use with a simple on/off button. 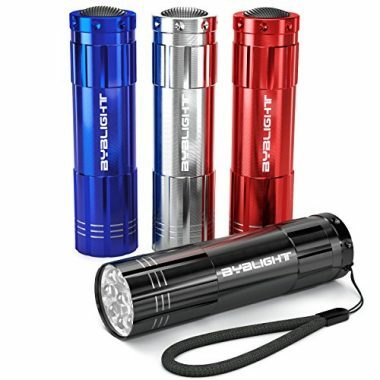 They come in silver, blue, red and black which all look very stylish and these flashlights will ensure that you are never going to be kept in the dark, they are highly rated and a great product. If something is marketed as a tactical flashlight, it generally means that it is built to last and is going to be highly durable. That is very much the case with this product as it is advertised as virtually indestructible which is going to be weather, shock and drop proof. If you’re number one priority is to have a light that is going to work perfectly in all conditions then this would be ideal. It is able to shine very brightly and has three powerful modes and also the ability to switch between a wide light and a more focused one. This is a very highly rated product and the company makes a lot of bold claims about its performance but the product is able to back that up. 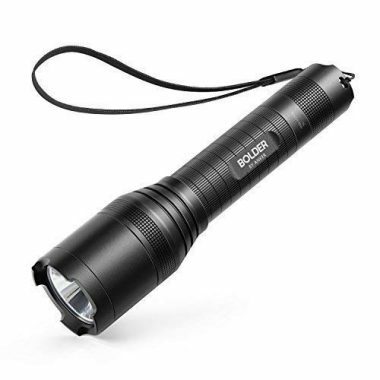 It’s a brilliant flashlight which is going to last you for a long time, it has a textured grip and a clip attached so you can always keep a hold of it. GearLight are another company who have been able to produce a high-quality flashlight. This product has a medium size to it and would be ideal to place in your backpack as it’s not going to be too heavy either. It has a very bright light which is going to be good enough for all your needs and it has a long battery life too, which means that you won’t constantly have to change them. This is another torch which has these five modes and a variable focus, making it ideal for all situations. The torch is both water resistant and durable so it will be able to deal with everything that is thrown at it. That includes being dropped from a height of 10 feet and also it can be briefly submerged under water. This is a two pack of flashlights so you are always going to have one available or share it with the person you are with, in order for you both to have a high quality light. It shines at 300 lumens and has three settings of high, medium and low. It has a skid-proof design and will feel very solid in your hand. It is also water resistant too, making it ideal for any outdoor activities where durability is going to be a key issue. The product is well made and built to last. It has a very compact size despite its ability to shine very brightly and will easily fit into the palm of your hand. It has adjustable focus which gives it a great degree of versatility and it can be powered by either a lithium-ion battery or one AA battery. This is another product from Anker and another one which has a very high level of quality. It has received many great reviews from those who have used it for a long time and you can have confidence that you are going to be getting a great product. It shines at 400 lumens and that light can reach a very long distance too, making this a torch which is going to be very useful in a number of different circumstances. It has three settings of high, low and strobe if you needed to save battery or were in an emergency. It’s a very durable product as it is water resistance and shock resistant too, partly due to its aluminum body which is going to be able to take a lot of punishment. It has a smart design and is very compact, which makes it easy to fit into your pocket or your bag. If you are going on an adventure where you are going to be coming into contact with water then this could be ideal for you. That’s due to the fact that not only is it waterproof but it actually floats too which means that you’ll never have to worry about losing it. Unlike most flashlights, this is one that comes in a wide range of different colors which gives you a better choice to suit your style. Six different options are available which all look great including bright colors which will help you spot your torch should you ever drop it. The light is powered by four individual LED bulbs which are going to be able to give it a lumens rating of 55. The flashlight has a built-in carabineer clip which gives you the ability to attach it to your belt or backpack for quick access and easy use. If you’re looking for the ultimate in portability then this penlight is going to be a great option. It has an extremely thin profile but is still able to shine a light which is very bright and can be used in a wide variety of different circumstances. It is made from an aluminum shell which is going to make the flashlight both corrosion proof and water resistant. It’s available in a wide range of different colors which all look very stylish with their smooth and compact design. The light has a rechargeable battery which is going to be able to last for a long time and the penlight features a spring loaded clip which will make it easy to attach to yourself or your bag. This is a highly rated product which gives a lot of performance for its size. When it comes to performance, you are not going to see a brighter flashlight than this one which has the same compact size, it is able to shine at 1,000 lumens despite being able to easily fit into the palm of your hand. 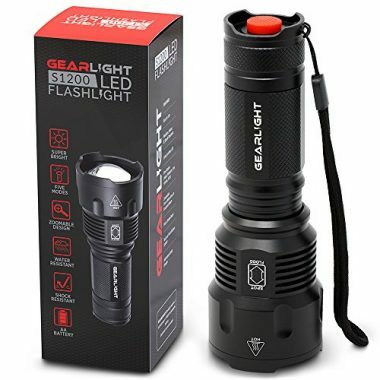 It has a range of different output modes which makes it a flashlight that you’re going to be able to use in a wide variety of different situations. The light also features a reminder that will indicate when you need to replace the battery. 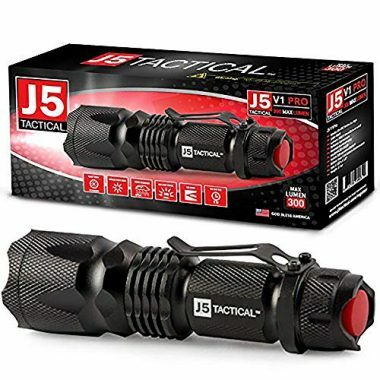 It has all the durability that you would expect from a tactical flashlight and it has a slip-resistant body design as well as an anti-roll design too. 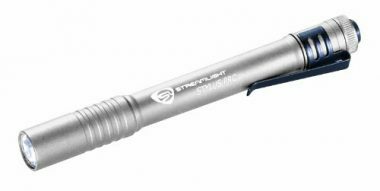 It’s made of aircraft grade aluminum and this is a light which is going to give you a high level of performance for a very long time. When it comes to flashlights, there are many different options available which all offer different features with different levels of brightness. You will know what you are specifically looking for in a light and that could be for camping or for home use but it’s always a great idea to get a versatile flashlight which is able to complete a number of different uses. In general terms, there are three main types of flashlight which are either LED flashlight, tactical flashlights or ultra-bright flashlights. In this guide we have only looked at the first two options which we will explain below. Here we look at the three options and why they’d be used. LED flashlights – These are the most common type which covers most of the products in this list. LED lights have long since replaced incandescent light bulbs due to their increased brightness, lower power usage and long life. You should no longer be getting a flashlight that has an incandescent bulb, as LED is far superior. There are plenty of great LED bulbs out there which are going to be able to give you a very high level of performance. These lights are generally going to have a good level of durability but will also be versatile and have numerous different modes as well as possibly the ability to have an adjustable focus. These lights will be good enough for almost anyone to use but they come in a range of different sizes but they will all be easily used with one hand but there are some options which happen to be a lot smaller too. If you’re looking for a higher level of toughness though, you might want to look into getting a tactical flashlight. Tactical flashlight – A tactical flashlight is one which has been designed for military use or been designed to be able to be worthy of that kind of title. That generally means that they have an extreme level of durability and are built to last. 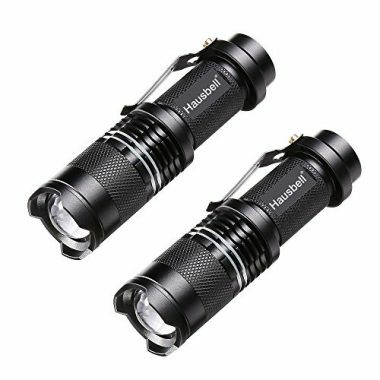 Some people love the look of these flashlights and also are given peace of mind by the high amount of durability that they have. These lights also generally have a very high lumens rating to give you an intense amount of light coverage. Despite that extreme durability and high amount of power, they are usually very compact which makes them ideal for backpacking and many other uses. They will have a large range of light settings and are usually made to the highest standards. Ultra-bright flashlight – It’s going to be very rare that you are going to need one of these types of flashlights as they have an incredible level of performance which is why they are generally only used by the likes of security guards and police. As you can imagine, these lights generally aren’t as compact and are a lot heavier. They have a low level of versatility and their power would be wasted on almost all uses. There is usually little point in getting a light which is that big. 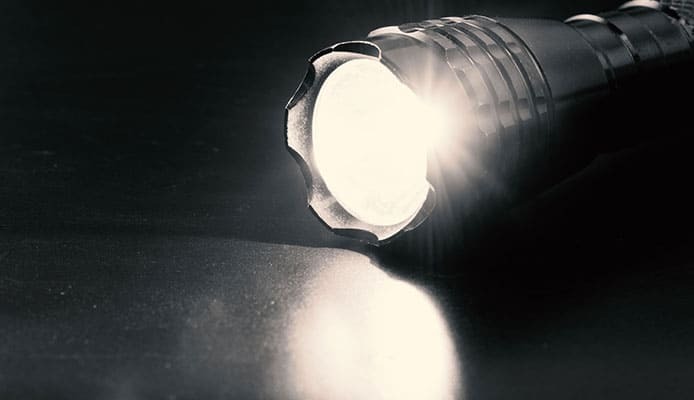 When it comes to flashlights, there are still a few different bulbs that you will be able to buy and here we will look at the main ones that are available and see why LED has become such a dominant bulb for flashlights. LED – LED is short for light emitting diode and it doesn’t seem that long ago that it was an emerging technology but it has now become an extremely popular option due to the advantages that it has. Price was often a downside of LED lights but this is come down considerably as they have gained popularity. LED lights have a very long lifespan which is another reason that their expense can be justified as they last for such a long time and often will be able to shine for up to 50,000 hours, they are also highly durable too and won’t break easily. Added to that, their brightness for the amount of power that they use up is extremely good and you are often able to get a brighter light than other bulbs for the same amount of energy usage. They can still be more expensive than other options but to get a lot of advantages for that. Incandescent – The incandescent bulb is the one that changed the world after it was perfected by Thomas Edison but it’s a bulb that sooner or later might be consigned to history as it starts to be faded out. It remains a common bulb though due to its low price. The downside to these bulbs though is that they use glass and a filament which means that break a lot more quickly than LED bulbs do and they don’t have anywhere near the same lifespan. Another advantage is that they produce a lot of heat and therefore waste energy so can’t shine as bright. They are cheap though and will remain common until other bulbs become cheaper. HID – There are a few rarer types of light bulbs which do have some advantages but not enough to be as common as LED. HID light bulbs big advantage is that they shine extremely brightly but that comes at a price of being quite bulky and also expensive too, so therefore these types aren’t ideal as a versatile flashlight. Xenon and Halogen – These lights are able to burn very brightly and like LED lights they do so by generating very little heat which helps them not use a lot of energy. They work with pressurized gas and can last for a long time but they don’t have the lifespan of an LED light so aren’t as popular. Shake – These lights work by shaking the flashlight which causes two magnets to create electromagnetic energy. This is very useful in times of emergency but you have to spend energy getting them to work and the light is not going to be very bright either. The lens is another important part of a flashlight as this has to be both clear and durable. It also needs to make sure that it doesn’t affect the light that is coming out of the bulb in a negative way, there are a few different options out there which are commonly seen. Borofloat glass – This is one of the best products when it comes to lenses as it’s going to be able to deal with any high temperature without warping. The glass is also very durable too so you can be confident in using it and then vitally it has a high level of transparency. Anti-reflective coated glass – This glass is going to be able to let through almost all of the light which is produced by the bulb but that comes at a cost. It isn’t as durable as other models and can get easily scratched with will severely affect its effectiveness. Plastic – As you can imagine this is the cheapest product on the market and it’s also going to be the worst too. 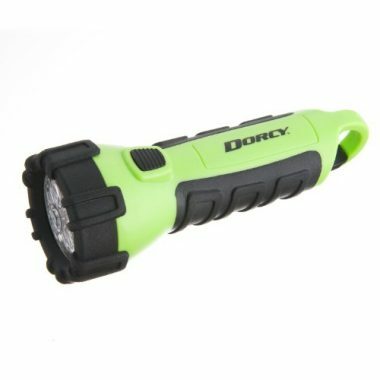 It can let through most light but it’s going to be easily damaged and this is not used on any decent flashlight model. Anti-scratch polycarbonate – This is going to be the best non-glass solution as this material is going to be able to let through a lot of light but does so while remaining highly durable. Its scratch-resistant qualities should mean that it lasts for a long time. As you have seen, these products come in a range of different design types which all fit different circumstances. Most of these flashlights will easily rest in the palm of your hand though and should be light enough so that they can easily be shone in any direction without effort. There are a few different design aspects which are important to look out for such as the shape of the flashlight. Cylindrical flashlights are a very common shape but it’s a good idea to make sure that they have a feature which stops it rolling away, which they otherwise easily can do. Some companies do this by having a flat surface on one side of the torch, others will simply have a no- cylindrical design while others will have a specific piece added to stop them from tolling. It’s a good idea to have one of these features in order to prevent accidents from happening. Another key design aspect is where to button is going to be for the light, as this can often be a personal preference. In most standard flashlights, the switch or button will be found on the head of the flashlight and on tactical products they are usually on the tail end of it. There is no great advantage to either and it is generally whichever you prefer. One unique design option is a pen light which is shaped to look like a pen and have an incredibly slender body. This is good for looking in tight spaces and it can also be very convenient to carry due to its size. Due to that size though, it doesn’t shine as brightly as other options. Another important design feature is how the handle is going to be shaped. You could be holding the flashlight when you have wet hands or you might have been sweating and it’s important to keep a firm grip of it. Having a textured surface with ridges along the way will help you to keep a firm grip of it and this is an important design point. There are other features too which might be useful for you such as a wrist strap to ensure that you secure the flashlight at all times. Another good securing method is a clip which a lot of these lights come with and you also want to make sure that the lens is going to have adequate protection. This size of your flashlight is going to be very important, especially if you are buying it for a specific task such as backpacking. In that situation you would want a flashlight which is going to be light enough but still small enough in order for it to be highly portable and not take up too much space. If all you need your torch for is home use then this is going to be less of an issue as you would just be able to store it in a safe place for it to be used when you need it. Whatever you require the flashlight for though, you’ll want to make sure that it’s small enough and light enough to be used easily with one hand. Weight is not a primary issue when it comes to flashlights but you still want to ensure that it is going to be comfortable to hold. There are obviously smaller options here which don’t have a lot of weight but there are others that heavier. Durability and weight generally go hand in hand and you want to make sure that it isn’t going to be too heavy if you get a product with a lot of protection. 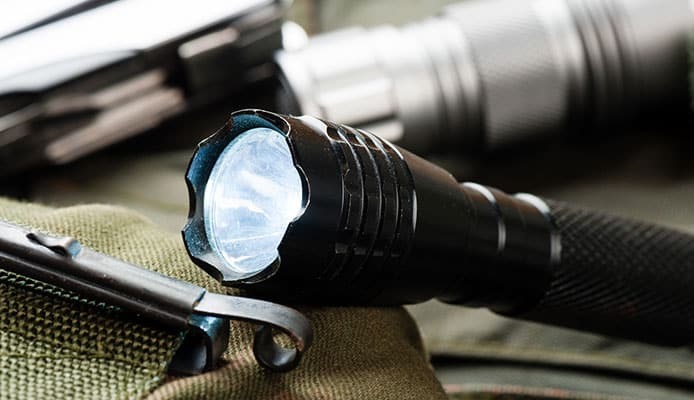 Tactical style flashlights generally do have a lot of protection but they can also be on the smaller side in terms of length as they aim to be a lot more compact. These devices cram a lot of technology and protection into a very short space and could be very useful if you’re outdoors in the dark. These products all tend to have a similar size as they will be around 4 or 5 inches long and easily sit in the palm of your hand. Regular flashlights can come in all different types of shapes and sizes as you have the thin pen lights but you can also get bulkier models too. It’s important to look at the size and weight to see how comfortable it is going to be for you and where you need to store it. Size is also loosely related to the brightness and usually the bigger models are going to be the ones with the most lumens. When you come to buy a flashlight, lumens are a rating that you are going to see a lot of. For a long time lightbulbs were seemingly just rated in watts, which isn’t a particularly good way of measuring what you are seeing and that is because it is a measure of power and not light. Lumens aren’t just a measure of light, as there are many different wavelengths of light including the ones that we can’t see. Instead, lumens are the measurement for the amount of natural light that is able to pass into our eye which makes it a better option of judging brightness. Due to this, it is a very accurate measurement of how bright a light is going to be and LED has changed this too as it produces a much brighter light with the same amount of wattage. A 60 watt incandescent bulb, for example, would produce around 800 lumens whereas the same amount of lumens could be shone from an 8 watt LED light. The inclination here would be that the more lumens, the better, but that isn’t always going to be the case depending on your circumstances. There are a lot of things to consider, especially the type of environment that you are going to be in. The lower end of the flashlight range is going to be anything up to around 100 lumens, these products are still going to be able to give you a significant amount of light but aren’t exactly going to completely light up the area around you. Up to 250 would be the next range of flashlights and these will be able to give you a great amount of brightness. At around 500 lumens though, you really start to get a very bright light which is going to be suitable for most uses that you are going to be able to have. At this level you will want the light to have other functions such as the ability to have different modes as well as an adjustable focus. Anything over that will be a very powerful light and anything that is around 1,000 will completely light up the area and could light up something which is probably around two football pitches away, this is obviously a product which goes beyond what most people will need a flashlight for. Anything above that level is going to be wasted on anyone who wants a flashlight for domestic use. Over 1,000 lumen flashlights are generally only used for security or other specific purposes. The best option for you is going to depend on the type of activity that you are going to do. If you are planning on using one in a tent for example then a 500 lumen light is going to be too bright. This is where you want to look for adjustable settings though as if the same torch as a ‘low’ light option then it’s going to be able to be used for a multitude of different situations. When it comes to any product you want to be given reassurances that if anything was to go wrong that you are going to be covered. Most of these products come with some type of warranty but it’s always important to read the fine print to know exactly how you are going to be covered. A long warranty is going to be able to give you peace of mind that you are not going to be wasting your money on buying something. It also gives you an impression that a company is confident in its product if it is offering a good warranty as they don’t feel as though they are ever going to have to refund the money. Most of these products will be able to offer a warranty which ranges from about 1 to 5 years and sometimes they will offer different things too. The higher end products which have an extreme level of durability often have a lifetime guarantee on them which gives you a lot of assurances. As said though, it’s important to know exactly what type of warranty that you are going to get as often you will see companies offering limited warranties which generally means that there are certain conditions under which the product is not going to be covered. One of those conditions is often that it is only going to be covered for defects which were made in the manufacturing process and not if the product breaks while in use. While a warranty can be a very useful thing to have on a product, it’s always good to check exactly what it is worth. While not all flashlights are going to be made to withstand the worst conditions that could be thrown at them, you do expect a certain amount of protection from your flashlight. The minimum protection that they should have is for them to be at least water resistant. Water resistant generally means that they would be used in the rain and able to cope with splashes and other brief contacts with water. A lot of water resistant products will even be able to deal with a small amount of time while they are submerged in the water. Waterproof products on the other hand will be able to be permanently submerged in the water without ever letting the water in, as long as they don’t go past a certain depth. If you are never going to be near a body of water then water resistance would be fine but if you are doing an activity such as kayaking, then waterproofing is going to be essential, even if you do have a dry bag as you never know when it will be used. When it comes to water resistance, items are often given a rating on the ‘IPX’ index which gives you a guide on how resistant a product is. A rating of IPX4, for example, will be able to handle splashes for a sustained period of time and this is going to be the minimum requirement when it comes to a flashlight. IPX 5 and 6 will be able to give you protection for a more intense period of time with a volume of water and full protection in the form of waterproofing isn’t offered until IPX8 where an item could be submerged in water up to a meter deep for up to 30 minutes. That’s going to be all the protection that a flashlight is going to need. The rating goes up to IPX8 but you won’t see this on these models as that is a rating for items that are specifically made for being used underwater for such activities as scuba diving and snorkeling. The impact resistance of a flashlight is important as it’s likely that sooner or later you are going to drop it or bang it against something. It is a product which was designed to be able to take a few knocks but different products have many different levels of impact resistance. In truth, you should be able to drop it out of your hand from a standing stance and carry on working. If it does then it’s not going to be a very durable torch and was never going to last you for a long time. Some level of impact resistance is going to be important. The most durable products should be able to be dropped from a significant distance of around 3 meters (around 10 feet) and be able to survive the fall. This is often the case with the tactical type of flashlights which are designed to withstand more brutal conditions. The importance of the impact resistance is often going to depend on the type of activity that you are doing. If you are backpacking, for example, then it’s unlikely that you are going to be dropping it from any great distance but if you are climbing then it is going to be much more likely. All the products that we have reviewed here have a good level of resistance but it’s important to analyze what you will be needing the flashlight for any get one that is going to match your situation, that way you know that you’re going to be covered. If something is ergonomic then it means that it was designed to be comfortable and efficient while it is being used. This is important for a flashlight as you could be holding it for quite a while and if it isn’t well designed then it is going to start to hurt your hand, which won’t be a pleasant experience. The first aspect you want to make sure of is that the handle is thin enough in order for you to be able to wrap your hand around of. This will ensure not only that you are not straining your hand muscles but also that you are able to have a firm grip on the torch. The head of the torch will usually be a lot larger in order to fit the bulb and it’s important that there isn’t too much weight in this are otherwise your flashlight is going to be unbalanced and difficult to hold. The handle of the flashlight also needs to be designed in such a way that it gives you a high level of grip. In order to have this the surface will be textured but it’s important that it’s not textured too much that it is uncomfortable to grip as it digs into your hand. There also generally needs to be a ribbed layer on the flashlight which is going to act like a barrier to prevent your hand from slipping. Your flashlight needs to have all these features while still feeling comfortable in your hand and you will be able to see how the torch is designed and how it is going to fit in your hands. If you have small hands then it might not be the best idea to get a torch which looks bulky. While a lot of these flashlights can be used for a wide variety of different activities, it’s important when deciding which one you are going to buy that you choose a flashlight which is going to be able to excel in the task that you are buying it for. If you are going to be out kayaking, for example, then it would be a good idea to not only get a flashlight that is waterproof but also one that floats. This would also be a good idea if you were getting a light for fishing due to your proximity to water and the chance of dropping it. If you were backpacking then you would most likely want a light which is going to have a high amount of lumens but also a high amount of durability too, as you will be in a more unforgiving environment. If you are camping then you would most likely want a light which has various light settings which you can change depending on your needs. You simply need to have a look at what your specific needs are and get a flashlight which is going to be able to match that to deliver exactly what you need for your purpose. Sometimes you wouldn’t want your light to be too bright and in other circumstances you’d want it to be as durable as possible, it’s all about what are the most important features to you. Reliability is a key aspect of your flashlight and you want to ensure that you are not going to be left out there in the middle of nowhere with a flashlight which has stopped working due to its reliability issues. This is always going to be a big issue and you want a flashlight that you can rely on in case of an emergency. At this stage it’s always a good idea to check out the user reviews to see what others are saying out the product. If you see that a product has a low rating then it’s unlikely that it is going to be the most reliable product in the world and it’s probably best to move on to something else. Another good way of ensuring that a product is going to be reliable is to make sure that you are getting your flashlight from a reputable company. This is not always going to be foolproof, getting a flashlight from a company that you know has a history of creating quality flashlights would be a good idea. As we mentioned before, seeing if a company is offering a good warranty is another good way of having peace of mind about its reliability. This will show how confident a company is in its product and gives you that reassurance that if anything should go wrong, that you would be able to get it sorted. While everyone would ideally want to get a product that is as durable as possible, there are a few other features which can be affected by the flashlight having a high amount of durability such as its weight. Having a high level of durability usually adds to cost too and not everyone would need that increased level. Water resistance is a feature which you would want in every flashlight as you never know when you are going to be coming into contact with water. It’s likely that you will at one stage whether that is with accidental splashes or simply being out in the rain. If you are going to be near water, having a waterproof flashlight would also be important. One big area which can vary from one flashlight to the next is the impact resistance of it. You would want to be able to drop it from at least arm height and for nothing to be wrong with it but some products will give you a much better protection than that. After that, there are the tactical torches which are going to be able to give you an extreme level of durability as will be able to cope with extreme levels of temperature change as well as extreme levels of pressure. These types of flashlight will often feature a strike plate too which will be able to be used as a weapon in the event of an emergency. The battery life of these products is going to vary a lot based on the type of flashlight that you have, how you are using it, the type of battery that you are using and also the brand of battery that you are using, as they all play a key role in ensuring that you have a flashlight which lasts. The brighter the flashlight that you have, the more power that it is going to need to use, in these circumstances though it’s likely that your flashlight would need a higher level of batteries in order for it to not run out very quickly which would also make the flashlight heavier overall. In terms of the battery life, how you are using it is going to be a key factor in how long it is going to last. A lot of these flashlights have different settings where you would be able to shine a low, medium or high light, for example. The low setting would be able to run for a lot longer than the high setting and therefore it’s important to only ever use what you need. The type of battery will also play an important role an most of these models will either come with the traditional AA/AAA batteries or will use lithium-ion batteries. 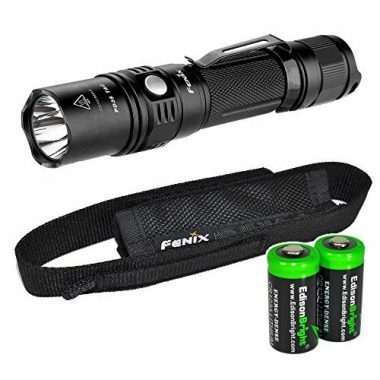 There are other types available and these flashlights will match up the specific requirements of the flashlight with that battery that they need. The type of brand that you are using too will also play a big role in battery life. While it is always tempting to get a cheap set of batteries, you do generally get what you pay for and that increase in cost will lead to an increase in battery life. It’s always a good idea to research what the best batteries are and get on which is going to last for a long time. Q: How Long Do Batteries Last? A: As we said there, many different factors are going to affect the battery life of your flashlight. If you are using a bright tactical flashlight when it should last for at least 5 hours of continuous use at its brightest setting but this will depend on the type of batteries that you buy. Flashlights with less of a brightness intensity and less power consumption would require less battery use and therefore might be able to last up to a day on continual use. As we mentioned, a lot of different factors will affect this and therefore it’s always important to monitor your battery situation. If you are getting rechargeable batteries then it’s always important that you stay near somewhere that is going to be a constant power source. With replaceable batteries, you always want to make sure that you bring enough with you on whatever type of trip that you are doing to ensure that they don’t run out. 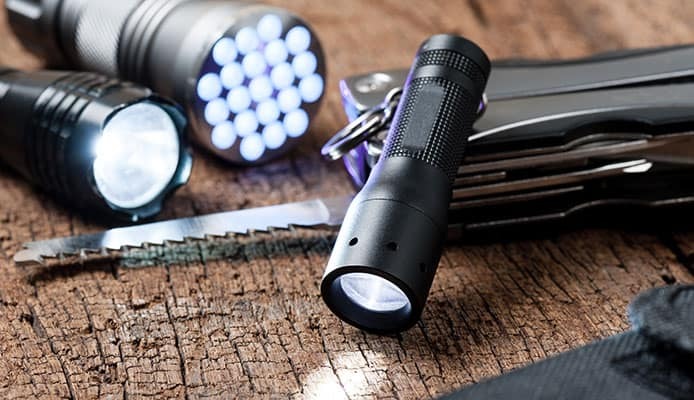 Q: How Do I Care For My Flashlight So It Lasts Longer? A: The products that we have reviewed here generally have a high level of durability and won’t break easily but they will still need some basic care in order to ensure that you are getting the most out of them and that they can last for a very long time. It’s important to clean the outside of your flashlight and this could be done via an alcohol pad or other types of wipe which is not going to be too harsh on the surface. For flashlights with a lot of grooves, it’s a good idea to use a small brush, such as a toothbrush, in order to clean out those bits where dirt can get trapped. It’s also important to clean the lens of the flashlight to ensure that the light coming out of it is not going to be affected by any smudges or dirt. This could be done via a lens wipe but it’s vital that you are not using anything which could scratch the lens. Inspecting the battery area of your flashlight is important to make sure that there is no dirt or corrosion in there and this could be scrubbed off is there is. Another important inspection point is the ‘O’ rings which are what is going to resist water getting into the battery. If these are starting to get dry then they should be lubricated and if they are cracked, should be replaced. Q: What Is The Best Size For A Flashlight? A: The best size for your flashlight should be a personal one depending on your needs. If you are backpacking, for example, then you need to make sure that it is going to fit in with all the rest of your gear and you will also want to make sure it is not too heavy too. If you are going to be in a more permanent camp then size isn’t going to really be an issue as you’re not going to have to take it very far. Likewise, if you just want it for home use then size isn’t really going to matter. This is all about making sure that the flashlight is going to match your circumstances. The size, and many other features, are all important to take into account as a whole to ensure that you have the perfect product for you. There is no specific best size for a flashlight, as this could depend on storage, weight, lumens and other factors. Flashlights can be a very important product in a wide number of different situations. Whether you are just getting one to store in your home or want one for when you are out fishing, it’s important to choose one which is going to be able to match your needs. If you are camping, for example, it might be a better idea to look for the best camping lantern if you need one for your tent or it could be that you want the adaptability of a flashlight, or both. Aspects such as size, design and durability are often more dependent on your specific requirements than anything else. That being said, you always want to make sure that you are getting a flashlight which is going to be durable, and water resistance is going to be essential too. Impact resistance is also important and you want to make sure that the flashlight is easy to hold, doesn’t weigh too much and that it is going to be reliable. Getting the right battery is a vital consideration, if you have nowhere to charge your flashlight then it’s not a good idea to get a rechargeable battery and need to make sure that you are bringing enough replacements. Once you have been able to work out the ideal flashlight for you then you will be able to choose a product which is going to match all of your needs. Hopefully this guide has given you all the information that you need in order to get the best flashlight for you, whatever use you’re going to have for it.